Runners around the world rushed yesterday to register online for the 2011 Boston Marathon, filling the race’s 20,000 available spots for qualifiers by day’s end and leaving the Boston Athletic Association stunned. The record-setting eight hour, three minute registration — a stark contrast to last year’s nine weeks and three days — left an untold number of qualified runners without a coveted bib number for next April. With the new registration record, the Boston Marathon solidified its place as one of the more popular and prestigious road races in the world. The record also highlights the changing landscape of marathon running, with more participants eager to run the biggest, most famous races. Until the 2006 race, the Boston Marathon did not reach capacity by its late-March registration deadline. The idea that it would fill in a day seemed hard to believe. As soon as registration opened at 9 a.m. yesterday, runners overwhelmed the BAA’s website, creating computer problems for a couple of hours. To resolve the technical issue and handle the deluge, the BAA made its homepage the race registration form. By noon, more than half the available spots were taken. Recognizing that the field would be filled by the end of the day, the BAA took to Facebook and Twitter to encourage qualified runners to register immediately. The BAA had anticipated that runners might want to register early and in record-breaking numbers. So it had ramped up its server capacity and e-mailed registration instructions and information to potential entrants. Qualifiers who mailed paper registration forms, charity runners, and invitational entries eventually will bring the field to roughly 26,000. But even the early notification was not enough. Runners shut out of the race felt angry, frustrated, and disappointed. “It makes me reluctant to come back,’’ said Kate Hovan of Monroe, Ga., who hoped to run her sixth consecutive Boston race. She said she had no idea the Marathon would fill up in one day, and tried unsuccessfully to register after work. The BAA estimates several thousand runners who planned to enter the 2010 race failed to register before it filled and probably made sure they signed up early this year. BAA officials say they realize they must respond to the spike in demand. To ensure the race remains accessible to as many runners as possible, the race may need to make its qualifying times tougher, institute an entry lottery, increase its field, or all three. Any decision the BAA makes will have repercussions throughout the running world and the eight cities and towns that line the historic course. 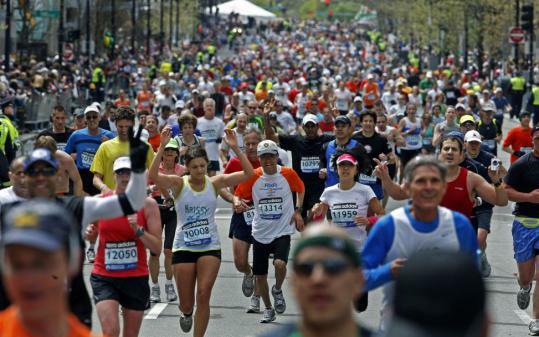 To qualify for the 2011 Boston Marathon, runners must meet certain time standards beginning Sept. 20, 2009. The standards vary by age and gender — 3 hours 10 minutes for men ages 18-34, 3:40 for women ages 18-34, and so on. The older the marathoner, the slower the qualifying time. All runners who registered yesterday must have their qualifying times verified before being officially entered in the race. In running communities around the world, achieving a Boston Marathon qualifying time carries a certain cachet. If Boston continues to fill quickly, some marathoners may simply satisfy themselves with qualifying and not race on Patriots Day. Yesterday’s registration kicked off six weeks later than in the past, ensuring qualifiers from major fall marathons would have time to enter the 2011 Boston Marathon before it filled up — or so they thought. Participants in the upcoming New York City Marathon now find themselves unable to register for Boston. One answer to the overload problem is to make it more difficult to qualify. But that comes with its own set of concerns: keeping a reasonable balance between male and female entrants, and making sure hard-training recreational runners still have their shot at a once-in-a-lifetime experience. Other options include narrowing the qualifying window and expanding the field, perhaps replacing the current two-wave start with three waves, and giving charity runners their own wave. At the earliest, any changes to qualifying times or field size would go into effect for the 2012 Marathon. For now, the BAA and the lucky runners who successfully registered must prepare for the race in April.